The Krapcho dealkoxycarbonylation reaction involves the loss of an alkoxycarbonyl group from a carbon bearing one or more electron-withdrawing groups. A proton or other electrophile replaces the alkoxycarbonyl group in the substrate. Activated esters bearing an electron-withdrawing group at the α position are useful substrates for a wide variety of reactions, including alkylation, electrophilic hydroxylation and amination, and conjugate addition reactions. Once the ester has served its purpose in the course of a synthesis, it often becomes necessary to replace the ester group with hydrogen. The Krapcho dealkoxycarbonylation reaction (Eq. 1) is the most popular method for accomplishing this transformation in a single pot (i.e., without the isolation of a carboxylic acid intermediate). The activated ester is heated in a polar aprotic solvent with a small amount of water and/or an inorganic salt. A stabilized anionic intermediate forms, along with carbon dioxide and either an alcohol (when water is used) or an alkyl halide or pseudohalide (when an inorganic salt and water are used). Protonation of the anionic intermediate yields the final product, in which hydrogen has replaced the alkoxycarbonyl group. Alternatively, trapping with an electrophile leads to the formation of a new carbon-electrophile bond in the product. In general, geminal diesters lose only one ester group, although conversion to the carboxylic acid and a second decarboxylation event may occur at prolonged temperatures and reaction times. Diastereoselective reactions typically result in the more stable diastereomer; however, the presence of an intramolecular acid in cyclic substrates may promote diastereoselective protonation. The scope of activating groups Y includes aldehydes, ketones, carboxylic acid derivatives, nitro groups, phosphoryl groups, and sulfonyl groups. In the absence of added inorganic salt, two mechanisms for the Krapcho dealkoxycarbonylation reaction have been proposed. When the alkyl group of the ester cannot support a positive charge, it appears that a water-catalyzed nucleophilic attack (BAC2, a formal attack by hydroxide) occurs first, followed by elimination of alcohol. Decarboxylation then occurs to afford an anionic intermediate, which is protonated by water to yield the dealkoxycarbonylated product (Eq. 2). When the alkyl group can support positive charge (e.g., R3 = benzyl or tert-butyl), an SN1-type mechanism may occur involving dissociation of the alkyl group followed by decarboxylation to afford the same anionic intermediate. Inorganic salts such as lithium chloride and sodium cyanide promote an SN2-type mechanism involving nucleophilic substitution at the alkyl carbon as a first step (BAC2 cleavage). 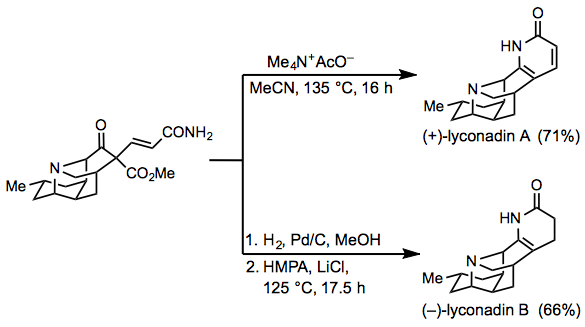 Decarboxylation, which may occur in a concerted fashion with nucleophilic substitution, produces an anionic intermediate that is subsequently protonated to afford the final product (Eq. 3). At pyrolytic temperatures, esters bearing at least one α-hydrogen form ketenes via elimination. One may thus suspect that ketenes could be involved in the mechanism of the Krapcho reaction; however, no additional evidence of the involvement of ketenes in the mechanism has been found. Activated esters containing one or more stereocenters may yield diastereomers upon dealkoxycarbonylation. At low temperatures and short reaction times, the favored isomer is derived from kinetically controlled protonation on the less hindered face of the anionic intermediate. At high temperatures and long reaction times, the major product is the more stable diastereomer because the protonated product equilibrates with the anionic intermediate (the conjugate base of the product). In cyclic systems containing a substituent β to the ester, for example, the trans isomer is typically favored over the cis isomer (particularly at high temperatures and long reaction times). One interesting exception involves substrates containing rigid acids β to the ester group: intramolecular protonation of the anionic intermediate occurs on the same face as the acid to afford a single diastereomer. In Eq. 4 below, the labels cis and trans refer to the relative positions of the ester and aryl groups. In general, predicting whether a particular reaction will proceed with kinetic or thermodynamic control is difficult. The Krapcho dealkoxycarbonylation has been used in a number of reactions to determine the enantiomeric purity of the α-carbon in the precursor. An example is shown in Eq. 4a. Epimerization of a stereogenic α-carbon in the substrate can be a significant issue for Krapcho reactions, particularly when the substrate is the less stable of a pair of epimers. For example, the reaction in Eq. 5 occurs with complete conversion to the isomer containing trans phenyl rings. Epimerization presumably occurs via proton transfer between the substrate and anionic intermediate formed in the course of the reaction. Krapcho alkoxydecarbonylation reactions are most commonly carried out on methyl or ethyl esters. The scope of the reaction is fairly broad, although some functional groups sensitive to nucleophiles may react in the presence of salt. Salt is ususally unnecessary in reactions of α-unsubstituted geminal diesters, but is often important in reactions of α-monosubstituted diesters. Added inorganic salt is essential in reactions of α,α-disubstituted geminal diesters. The scope of the reaction extends to activated esters bearing electron-withdrawing groups other than esters at the α-position. α-Monosubstituted malonate esters may be prepared via nucleophilic substitution (Eq. 6). Although most dealkoxycarbonylations of this class of substrates require added inorganic salt, the conjugate base of the leaving group can serve as an in situ promoter of dealkoxycarbonylation. α,α-Disubstituted malonates may be prepared from alkyl halides or allylic systems (Eq. 7), or from alcohols via the Mitsunobu reaction. Loss of both ester groups may occur when the reaction is carried out at high temperatures. 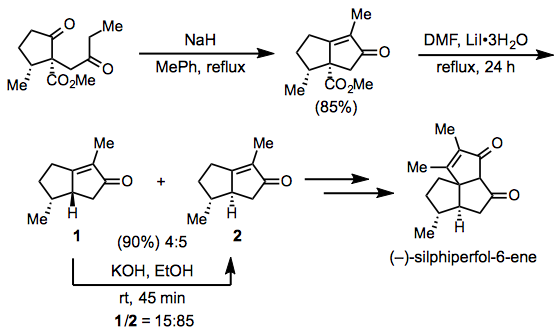 Cyclic geminal diesters are excellent substrates for the Krapcho dealkoxycarbonylation (Eq. 8). Inorganic salts must be employed in reactions of this class of substrates. Krapcho dealkoxycarbonylation is a versatile method for the preparation of acyclic ketones from β-keto esters (Eq. 9). These substrates are typically prepared via alkylation of simpler β-keto esters or via Claisen condensation. Cyclic β-keto esters are also excellent substrates for the reaction. In the example in Eq. 10, dealkoxycarbonylation affords an α-keto lactam. Among other activated esters, α-cyano esters are useful substrates for dealkoxycarbonylation. Substrates containing embedded ionic salts (such as ammonium halides) do not require added inorganic salt to undergo dealkoxycarbonylation (Eq. 11). Vinylogous diesters are also amenable to dealkoxycarbonylation (Eq. 12). The site of protonation of the conjugated enolate is thermodynamically controlled under the most common reaction conditions. The enolate intermediate produced after decarboxylation may be trapped by electrophiles such as alkyl halides, although trapping reactions are not always successful. Alkylation by the electrophilic byproduct of reactions employing inorganic salts can be a significant problem in some cases (Eq. 13). A number of Krapcho dealkoxycarbonylations have been performed using microwave irradiations (Mw). The example shown in Eq. 18a is a rare example where the conventional thermal procedure fails. The ester is a versatile functional group, and dealkoxycarbonylation enables one to use an ester as a "masked" hydrogen atom in the course of a synthesis. Once an ester has served its synthetic purpose, it can be removed using the Krapcho reaction. A number of syntheses have exploited this idea, including the synthesis of (–)-silphiperfol-6-ene shown in Eq. 15 below. Dealkoxycarbonylation produced a mixture of diastereomers 4 and 5, which were equilibrated and carried on to the target. One route for the synthesis of lyconidin A used a dealkoxycarbonylation-cyclization reaction as a key step to establish the lactam ring of the target molecule. From the same synthetic intermediate, hydrogenation followed by dealkoxycarbonylation afforded lyconidin B in slightly lower yield (Eq. 16). A number of methods are known for the dealkoxycarbonylation of activated esters in addition to the Krapcho reaction. While many of these exhibit yields that are comparable to the Krapcho reaction, few rival its the operational simplicity and scope. For example, the palladium-catalyzed reaction shown in Eq. 17 is limited to allyl esters. Amine bases have been employed for dealkoxycarbonylation, and the proposed mechanism of this reaction is analogous to the mechanism of the Krapcho reaction (Eq. 18). 1,4-Diazabicyclo[2.2.2]octane (DABCO) is the most popular base used, although 1,8-diazabicycloundec-7-ene (DBU) is also employed in this context. In the example below, decarboxylation of the bridgehead ester groups does not occur. Pyridine and lithium iodide accomplish the conversion of esters to carboxylic acids at elevated temperatures. When the ester is activated with an electron-withdrawing group at the α position, decarboxylation occurs spontaneously under these reaction conditions. This reaction has been applied most commonly to β-keto esters; reactions of geminal diesters (Eq. 19) are less common. Activated esters have been dealkoxycarbonylated by the actions of 4-aminothiophenol and catalytic amounts of cesium carbonate in DMF at temperatures of 80-100 °C. This procedure has not found widespread use to date. An illustrative example is shown in Eq. 20. The Krapcho dealkoxycarbonylation reaction employs polar solvents, the most common of which are dimethyl sulfoxide (DMSO), dimethyl formamide (DMF), and N-methylpyrrolidone (NMP). Hexamethylphosphoramide (HMPA) has also been employed as a solvent for the reaction. Salts used must include a mildly nucleophilic anion. Alkali metal halides, cyanides, and acetates are commonly used. Reactions are generally carried in a flask equipped with a magnetic stir bar, a condenser, and a gas bubbler to vent carbon dioxide and other volatiles formed during the reaction. Note that evolution of carbon dioxide is not quantitative due to consumption of some of the gas via reaction with hydroxide. Inert atmosphere (nitrogen or argon) is recommended for reactions employing inorganic salts, as oxidation of the intermediate enolates may occur. Dealkoxycarbonylation of an a-Monosubstituted Diethyl Malonate with DMSO and LiCl. To a solution of diethyl 2-(3aS,4S,6aR)-6-(trityloxymethyl)-2,2-dimethyl-4,6a-dihydro-3aH-cyclopenta[d][1,3]dioxol-4-yl)malonate (7.5 g, 13.4 mmol) in DMSO (50 mL) were added LiCl (1.67 g, 39.4 mmol) and H2O (2 drops). The mixture was heated at 175 °C for 3 hours, cooled, H2O (50 mL) was added. and the mixture was extracted with ethyl acetate (2 x 200 mL). The extracts were washed with brine, dried over MgSO4, and concentrated under reduced pressure. The product was purified by column chromatography on silica gel using hexane/EtOAc (9:1) as eluent to afford the product shown (5.7 g, 86%) as a white solid, mp 119 °C; [α]25D = –58° (c = 1, CHCl3); 1H NMR (500 MHz, CDCl3) δ 7.46 (m, 6H), 7.30–7.20 (m, 9H), 5.86 (s,1H), 5.01 (d, J = 5.5 Hz,1H), 4.48 (d, J = 5.5 Hz, 1H), 4.15 (q, 2H), 3.83 (d, J = 14.5 Hz, 1H), 3.65 (d, J = 14.5 Hz, 1H), 3.18 ( t, J = 6 Hz, 1H), 2.40 (dd, J = 2.0, 7.5 Hz, 2H), 1.36 (s, 3H), 1.31 (s, 3H), 1.26 (t, J = 7 Hz, 3H); 13C NMR (125 MHz, CDCl3) δ 171.9, 144.0, 142.7, 128.6, 128.2, 127.8, 127.0, 110.6, 86.9, 84.5, 83.7, 61.4, 60.6, 47.3, 38.0, 27.6, 26.1, 14.2; HRMS-ESI (m/z) (M+H)+ Calc'd. for C32H34O5: 499.2484. Found, 499.2478. Dealkoxycarbonylation of a Six-Membered Cyclic Geminal Dimethyl Ester Using Microwave Irradiation. Dimethyl 6-oxo-7,8-dihydropyrido[1,2-a]indole-9,9(6H)-dicarboxylate (84 mg, 0.28 mmol) was dissolved in DMF (3 mL) in a microwave vial (2–5 mL). LiCl (approximately 2 mg) and water (1 drop) was added and the sealed vial was irradiated in a microwave oven at 180 °C for 10 minutes. The cooled mixture was diluted with diethyl ether, washed with water, brine, and dried (MgSO4). The solvent was removed under vacuum and the residue was purified by flash chromatography (10-40% ethyl acetate/hexane, gradient elution) to yield the product shown (44 mg, 65%) as an orange oil; Rf = 0.65 (50% ethyl acetate/hexanes); 1H NMR (600 MHz, CDCl3) δ 8.41 (d, J = 8.4 Hz, 1H), 7.45 (d, J = 8.4 Hz, 1H), 7.27 (dd, J = 8.4, 7.8 Hz, 1H), 7.22 (dd, J = 8.4, 7.8 Hz, 1H), 6.48 (s, 1H), 4.03 (t, J = 6.0 Hz, 1H), 3.73 (s, 3H), 2.93-2.98 (m, 1H), 2.36–2.41 (m, 1H), 2.24-2.29 (m, 1H); 13C NMR (100 MHz, CDCl3) δ 171.3, 168.3, 135.0, 134.1, 129.2, 124.8, 124.1, 120.2, 116.5, 107.2, 52.6, 39.8, 31.8, 24.1; HRMS Calc'd. for C14H13NO3 243.0895. Found, 243.0885. ↑ a b Krapcho, A. P.; Weimaster, J. F.; Eldridge, J. M.; Jahngen, E. G. E., Jr.; Lovey, A. J.; Stephens, W. P. J. Org. Chem. 1978, 43, 138. ↑ Krapcho, A. P.; Gadamasetti, K. J. Org. Chem. 1987, 52, 1880. ↑ Curran, D. P.; Zhang, Q. Adv. Synth. Catal. 2003, 345, 329. ↑ Sanders, S. A.; Ruiz-Olalla, A.; Johnson, J. S. Chem. Commun. 2009, 5135. ↑ Dawson, G. J.; Williams, J. M. J.; Coote, S. J. Tetrahedron: Asymmetry 1995, 6, 2535. ↑ Rowland, A. T.; Hohneker, J. A.; McDaniel, K. F.; Moore, D. S. J. Org. Chem. 1982, 47, 301. ↑ Stevens, R. V.; Gaeta, F. C. A. J. Am. Chem. Soc. 1977, 99, 6105. ↑ Bernard, A. M.; Piras, P. P. Synth. Commun. 1997, 27, 709. ↑ Selvakumar, N.; Reddy, B. Y.; Kumar, G. S.; Iqbal, J. Tetrahedron Lett. 2001, 42, 8395. ↑ Caussanel, F.; Wang, K.; Ramachandran, S. A.; Deslongchamps, P. J. Org. Chem. 2006, 71, 7370. ↑ Scheid, G.; Kuit, W.; Ruijter, E.; Orru, R. V. A.; Henke, E.; Bornscheuer, U.; Wessjohann, L. A. Eur. J. Org. Chem. 2004, 1063. ↑ Tsuda, Y.; Sakai, Y.; Nakai, A.; Kaneko, M.; Ishiguro, Y.; Isore, K.; Taga, J.-I., Sano, T. Chem. Pharm. Bull. 1990, 38, 1462. ↑ Miller, R. B.; Smith, B. F. Synth. Commun. 1973, 3, 413. ↑ Pal, S.; Satyanarayana, G. O. S. V.; Bhattachattjee, G.; Chatak, U. R. Indian J. Chem., Sect. B 1996, 35, 286. ↑ Asaoka, M.; Miyake, K.; Takei, H. Chem. Lett. 1975, 1149. ↑ Wendeborn, S.; Nussbaumer, H.; Robert, F.; Jörg, M.; Pachlatko, J. P. Tetrahedron Lett. 2002, 43, 5461. ↑ Paquette, L. A.; Roberts, R. A.; Drtina, G. J. J. Am. Chem. Soc. 1984, 106, 6690. ↑ Beshore, D. C.; Smith, A. B., III. J. Am. Chem. Soc. 2007, 129, 4148. ↑ Suginome, H.; Orito, K.; Yorita, K.; Ishikawa, M.; Shimoyama, M.; Sasaki, T. J. Org. Chem. 1995, 60, 3052. ↑ Huang, B.-S.; Parish, E. J.; Miles, D. H. J. Org. Chem. 1974, 39, 2647. ↑ Hirai, K.; Fujimoto, K.; Iwano, Y.; Hiraoka, T.; Hata, T.; Tamura, C. Tetrahedron Lett. 1981, 22, 1021. ↑ Keinan, E.; Eren, D. J. Org. Chem. 1986, 51, 3165. ↑ Rao, J. R.; Schinazi, R. F.; Chu, K. Bioorg. Med. Chem. 2007, 15, 839. ↑ Magolan, J.; Carson, C. A.; Kerr, M. A. Org. Lett. 2008, 10, 1437. This page was last modified on 5 September 2013, at 03:29.